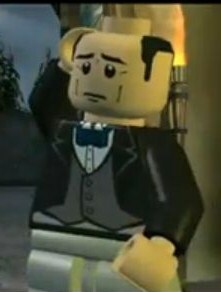 Enemy Butler is a minifigure that appears in LEGO Indiana Jones: The Original Adventures. He looks similar to Alfred from Batman, but without a mustache. The character has black hair and is also playable in all versions of the game but is not featured in its sequel. The butler has balding black hair printed onto his head and a thin face. He wears a black jacket, grey vest, matching pants, and a blue bow-tie. His only ability in game is Nazi access. The Enemy Butler is the butler of Castle Brunwald. In the movie, Indiana Jones disguises himself as a Scottish lord (Lord Clarence MacDonald) and disguises Elsa Schneider as his assistant, to get inside of Castle Brunwald to save his father, Henry Jones. Henry Jones had been kidnapped by the Germans by saying he was there to examine the tapestries. The butler does not fall for his disguise and retorts to Indy, "If you are a Scottish lord then I am Mickey Mouse!" Indy then knocks him out with a single punch and moves onward through the castle.